Talk Nerdy To Me: Instant 3-D Converter - Want. 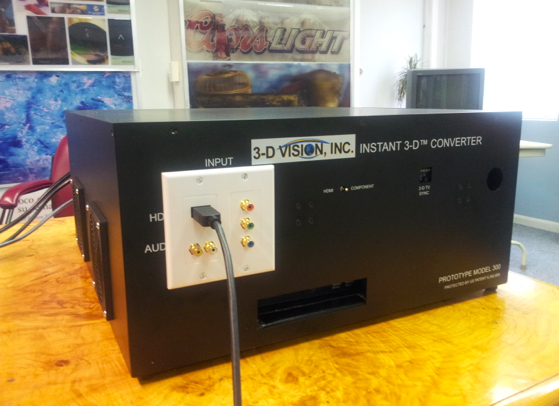 Instant 3-D Converter - Want. I admit it. I am a sucker for 3DTV and I’m always trying to get others onboard with the viewing experience. When my parents recently moved, their housewarming gift was a 3DTV with 3D Blu-ray player. And, since there are six people in our family, yup, I coughed up the money for six pairs of active glasses. Quite simply, I think the right in-home theater system is a visually stunning experience though I know I stand in the minority. There are quite a few reasons why 3D hasn't lived up to the hype. First; many don't feel there is enough 3D content (there isn't), others think the glasses are silly, expensive, bulky and just plain dumb, and nowadays some don't even realize they are purchasing 3D capable TVs as manufacturers are future-proofing televisions with the technology. But the main reason I don't think many have been on board with 3D is because they haven't experienced the true in-home experience (this isn't iMax we're talking about!). Anyways, I digressed. My point is, I am excited about a new device that could hit the market. It’s the 3-D Vision Instant 3D Converter. It is a gadget currently on Fundable. 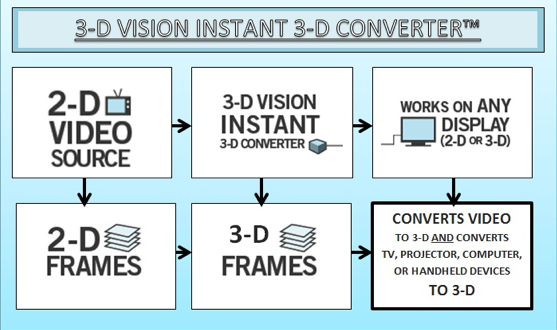 It does exactly what it says: converts any content on your TV screen to 3D. In short, it uses a proprietary, patented technology and comes with two pairs of special glasses (one for TV and one for use with handheld gaming consoles and computers). Since it converts any content, that means you can watch movies, old school westerns and rock your Kinect -all in 3D. Some ideas on sites like Kickstarter, IndieGoGo and Fundable are lofty visions. However, this comes from Gene Dolgoff. Amongst many accolades, Gene invented digital projection and the world’s first LCD projector in 1984. Dolgoff also suggested the Holodeck idea to Gene Rodenberry (#nerdcred) and holds 65 global patents. They have currently raised 31% of funding goals. Click here for the funding page. Right now you can score an early unit for a minimum $149 donation. I hope to check it out in person this week and report back on the experience. My TV does this for me out of the box. The biggest value this unit provides is that it turns ANY content into 3D. So, even if you have a 3D tv, you can only watch a little content. With this, you can watch any movie imaginable in 3D and play any video games in 3D. It's really cool. True, but 3-D TVs can be so pricey! 3D-Vision is planning to retail for around $299, so for the price of an ipod anyone can have 3D. It also enhances 3-D TV, and turns ANY content into 3D, not just select content. As crazy as I am about 3DTV - my 42" Plasma does not have the capability. It doesnt make sense to shell out the money for a brand new set when its perfectly fine - so I have to live without the feature. I think a lot of people are in this boat - they upgraded to a flatscreen without 3D. They are not going to buy another TV just for the feature ... making this a great option. I think you guys are missing the point - it converts content that was NOT recorded in 3d into 3d. Even if you have a 3d television this makes it 100x more valuable. Not a fan of the 3D TV unless someone hooked me up w one for free or really huge discount. When it first came out, I was all exited & went 2 the store to try it out.. & it was pretty lame when I could get a primo projector or a nice hd LCD for like 2/3 the price of 3D. Plus i'm on my Other gadgets for eg)iPad/Phone/Macs/Pcs most of the time and i just leave my TV on the background as a radio as I get busy w wtv Im doing at the moment. Till they release something way more visually intricate that awes me in 3D rather than adding the color yellow and call it 3D, then Im sold. & that's a hypothetical 'If'. You can also use this on your ipad/iphone. I don't imagine it would be something you would want to use all of the time. I would use it to watch my favorite movies and play my favorite video games. @Will - Clarification - no one is going to buy a 3D converter box if they think 3D is not worth it. Hence the few paragraphs in the article stating that truly experiencing it makes a box like this worthwhile. Yes, the fact that this converts all content (even that on a 3DTV that is not shot in 3D) is valuable as well. Understand. 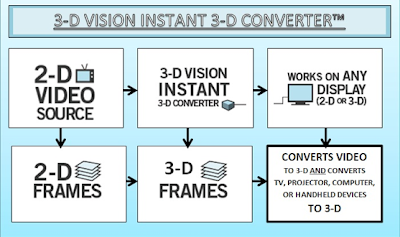 The Instant 3-D converter system converts and also enables the display of any video source sent through it into realistic 3-D on any TV, computer or handheld device. No 3DTV is required. Unlimited 3D content on your existing TV. This is a classic long "con", the smart-lipped guy and the miracle cure for 3D in a bottle. Then again the stock market is going up while the economy is going down in the toilet, so, there is an fool in every corner and I am sure he will find plenty of victims to finance this non-sense. Con? If you live anywhere near NYC maybe you should attend. Gene will be presenting his new 2-D to 3-D Converter at the New York Games Conference at 4pm on Wednesday, September 5th at the Museum of Jewish Heritage in NYC! He will also be doing demos for anyone interested throughout the day! For more info on how you can attend and see the 2-D to 3-D Converter in action, please visit the NY Games Conference website.